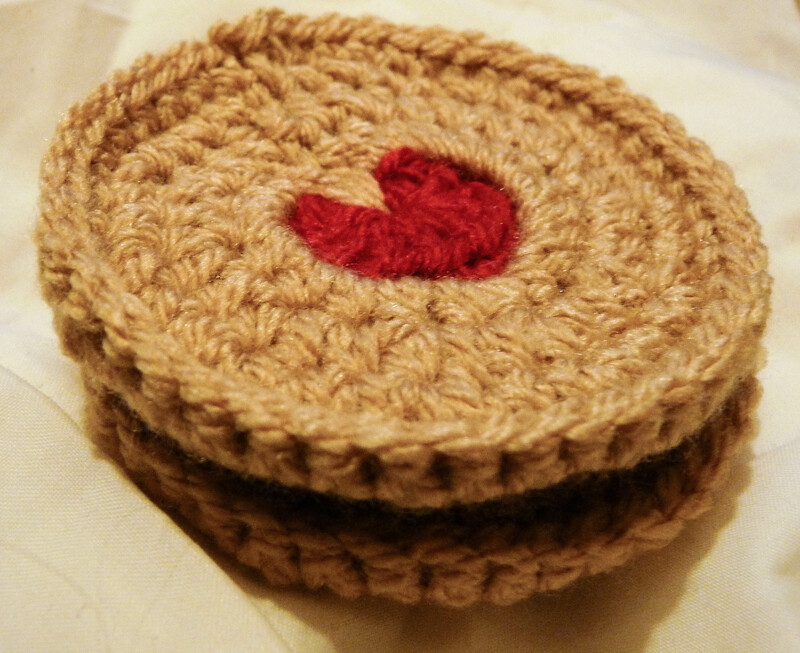 While browsing Ravelry I found this pattern for crochet Jammy Dodgers, and I realised I needed them right now. You don’t know how sad I am that these aren’t real. Since the maker of the pattern has given permission for people to sell these (it’s in the comments, a little ways down) I was thinking of selling these in my (hopefully) new etsy shop as coasters. Packs of 2 maybe? I’ll have to think about it. FO Friday has not come around for me this week. My wrist has never quite been the same since I crocheted an exhibition piece for work experience about 2 years ago. I had to crochet non-stop for about 4 days in order to get it done in time, and I must have done something. Needless to say I can’t knit or crochet as much as I used to be able and I do need regular breaks. Or at least I tell myself that. I don’t want to make it worse so I’m having to take a break for a bit, hence no FOs. 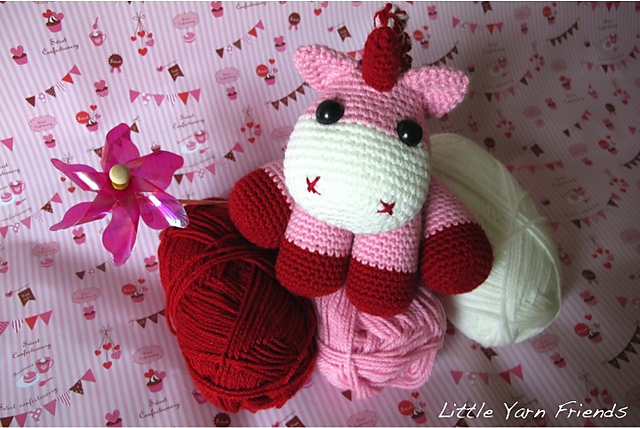 I have worked a bit on my jumper and am on the last decrease row, and I’ve been trying to figure out how long it takes or me to make one unicorn so I can price accordingly. I’ve run out of stuffing though so I can’t work on it until I get paid so I can buy some more. I might not post for a few days, because a new MMORPG (Massively Multiplayer Online Role Playing Game) called Guild Wars 2 (you might have heard of it) is coming out in a few hours, and I do like my MMORPGs. I’ve been waiting for this for years as well, so my attentions will be diverted haha. Hopefully I’ll be able to get a wrist brace and my wrist will hurt less so I can get some crochet and knitting done soon. Progress on my not-so-little unicorn. Finally decided on a leg pattern I’m happy with, might make it a bit smaller for the front legs but who knows. Otherwise I’m very happy with this. 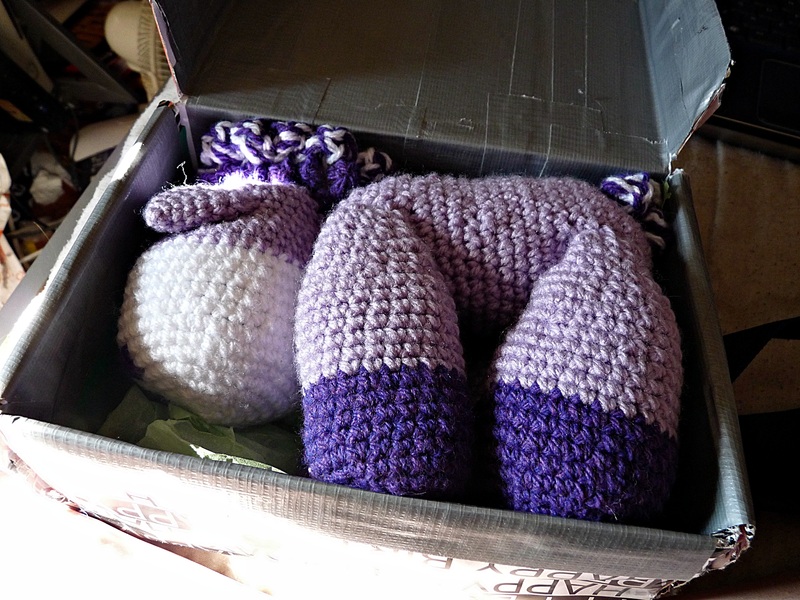 Creating Jointed Limbs for Your Amigurumi—The Complete Idiot’s Quick Guide. I was looking for a way to create seamless joints in crocheted toys, and while I was aware of the button method I had no idea about the thread or safety eye method. This will definitely come in useful for the pattern I’m making. 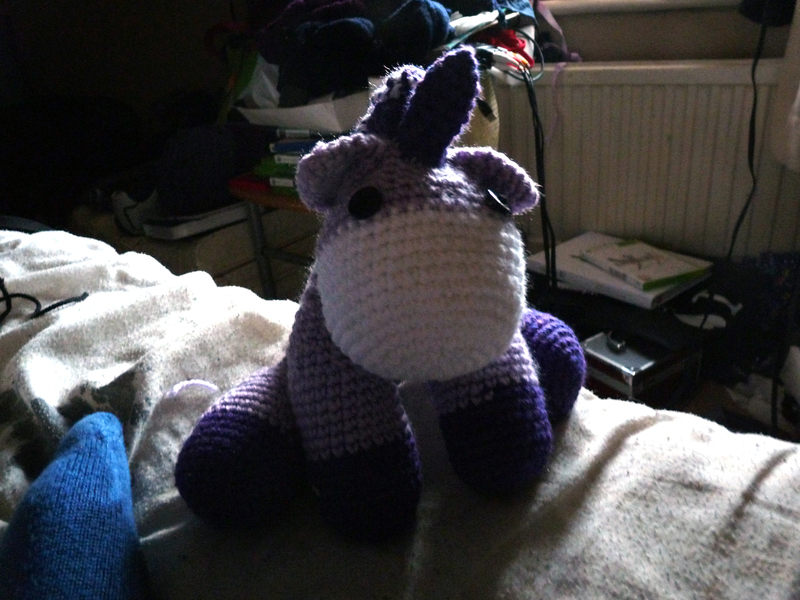 As you may or may not have seen from my last post, I am making a unicorn pattern based on the one I made for my friend. I’m not just changing a few rows here and there, it’s more like using it as a base and adding and taking away things, or changing things completely. I think what I have done so far is sufficiently different from the original pattern to be called it’s own. I tried doing short-ish legs but they just looked odd with the full sized head and body, so I’m thinking either proportioned legs or longer than usual legs? I’ll be trying these out later today when it’s not 3am, but I was wondering what people thought. He’s about 5 inches tall right now without limbs. I’ll probably use safety eyes instead of buttons since this won’t be child safe anyway with the mane the way it is, unless I decide I like the aesthetic or if other people like it. I’m happy with it so far, but I’ll see how I feel after I have some sleep, but right now I’m proud with what I came up with. Nothing I have made so far has followed the original pattern exactly, just as a guide for measurements. The head is a completely different shape as well, more realistic and less cute. I’d prefer it if it was a bit cuter but I’m not sure how to do that without making it silly. Maybe bigger eyes or a wider top head? Figure that out later. Writing a crochet pattern takes a lot of time and effort. I think I have finally made the decision to make and sell crocheted items, specifically toys. I am currently trying to write and make a pattern that is similar to what I made for my friends birthday, but different enough so I’m not copying or whatever. I guess I’m using that pattern as a base or guide to get basic shapes right? Usually I just guess. As you can see there are a lot of changes and re-writes. There will probably be more to come and with gradually change more and more. I was thinking of making them all or most OOAK (One of a Kind) since doing the same thing over and over does get a bit boring after a while, however I was also thinking of making an LGBT*QIA (or whatever that acronym is now) section, so there would be asexual pride unicorns and gay pride unicorns and genderqueer pride unicorns etc etc and I don’t think I’d get bored of that? I’ll see how it goes. I managed to get a lift from a friend to help get me to my friends house where the party was being held, and the first thing we saw was a giant inflatable slide. When she said bouncy castle I thought she just meant a small thing, not a huge tall slide. It was fun to go down though. 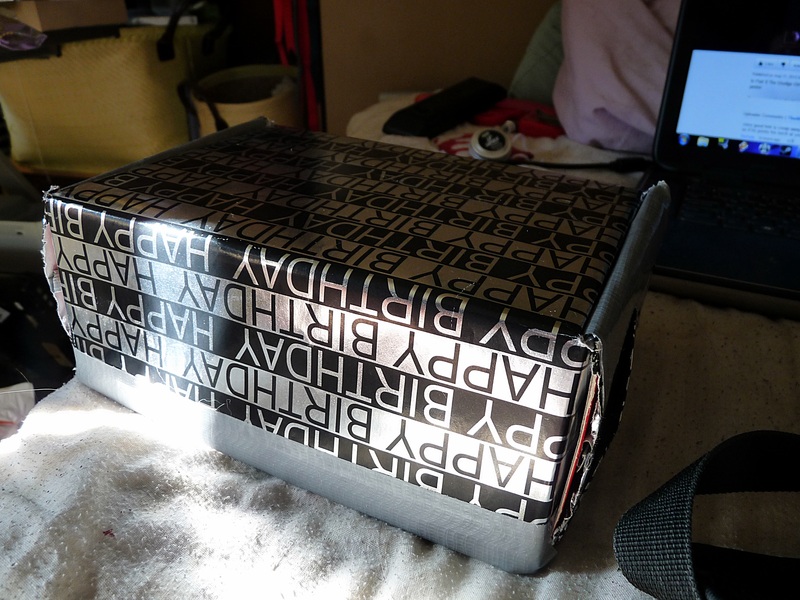 I had hastily wrapped her present in an old box I found and covered it in wrapping paper. 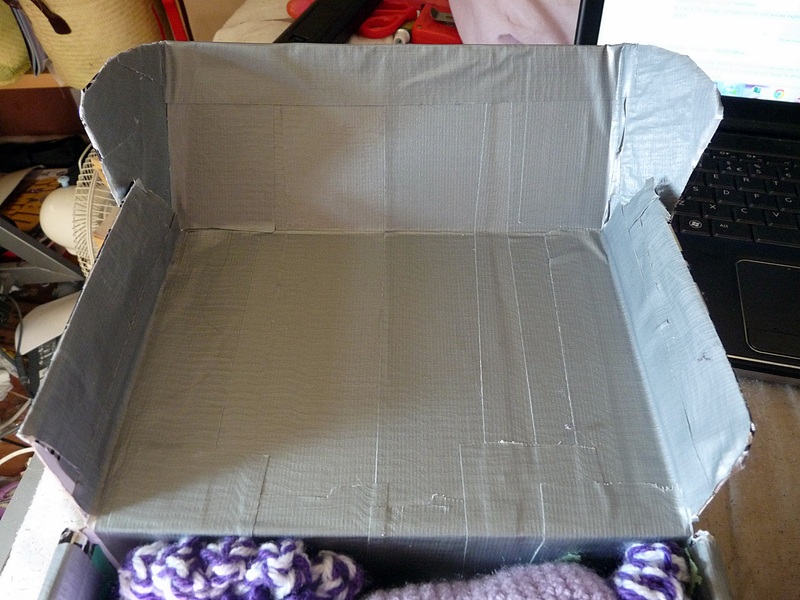 I had the genius idea of covering the inside with duct tape, since it hid the joins. Improvisation is my strong point, how do you think I passed English? I personally think it looks like an improvised coffin, but it worked and she got to the party safely. I guess my friend could also reuse the box too, so that’s a thing. 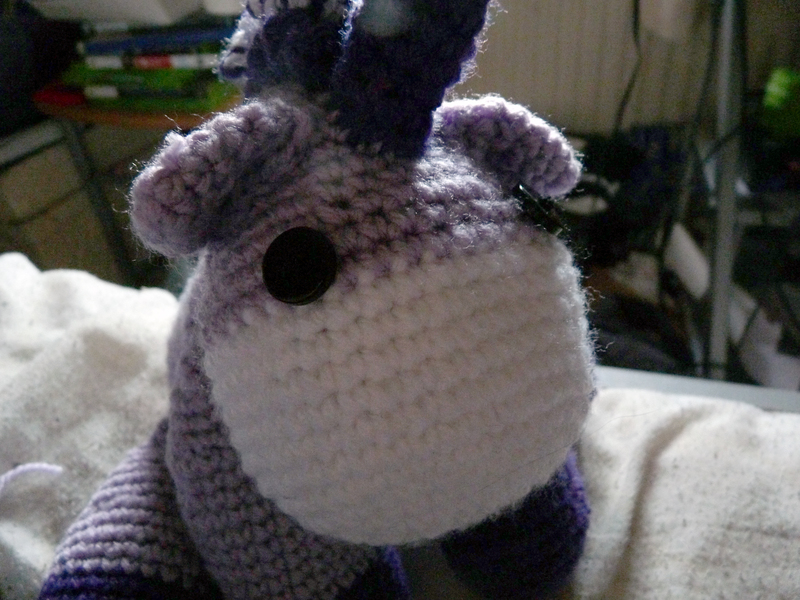 Say hello to Charlize the Unicorn, although that is my name choice, not my friends. After two days of almost solid work I have got her finished just in time for my friends birthday party. I added little crosses for her nose and used duplicate stitch to swing the colour change to the back since I took these photos, so don’t worry about it looking odd. I’ll be taking a small break (I’ll probably last two days knowing me) so my wrist can recover. After working on this from 8am this morning to 9pm this evening, and after many distractions, I managed to finish all the legs of this unicorn and her body. And attach them. Pretty proud of that not gonna lie. It is even on both sides, I guess I just posed her a bit sloppily. She even stands up and stays quite well surprisingly. The pattern makes her a bit bottom heavy which probably helps. Reminds me of Shadow of the Colossus a bit. But more purple and less creepy. And headless. Should be able to get the rest done tomorrow (I’ll have to, the party’s on Saturday) and the only big thing to do is the head. No way am I getting a zombie one done, but I might make myself one after I’ve gotten my jumper done, or maybe as a sort of distraction project if I get bored with the jumper. I sense a birthday coming on. It’s one of my friends birthday parties on the 18th and I have yet to make her a present. Technically her birthday was on the 11th, but there was no way of seeing her then. After asking one of our mutual friends for a list of things she likes, and knowing I can not make something like a scarf in a day, I was a bit relieved to see she liked things things that could be made into amigurumi. Like unicorns. I’m thinking of making two of these, a generic cute one and a zombie one but I’m not sure if that’s a bit over-ambitious. 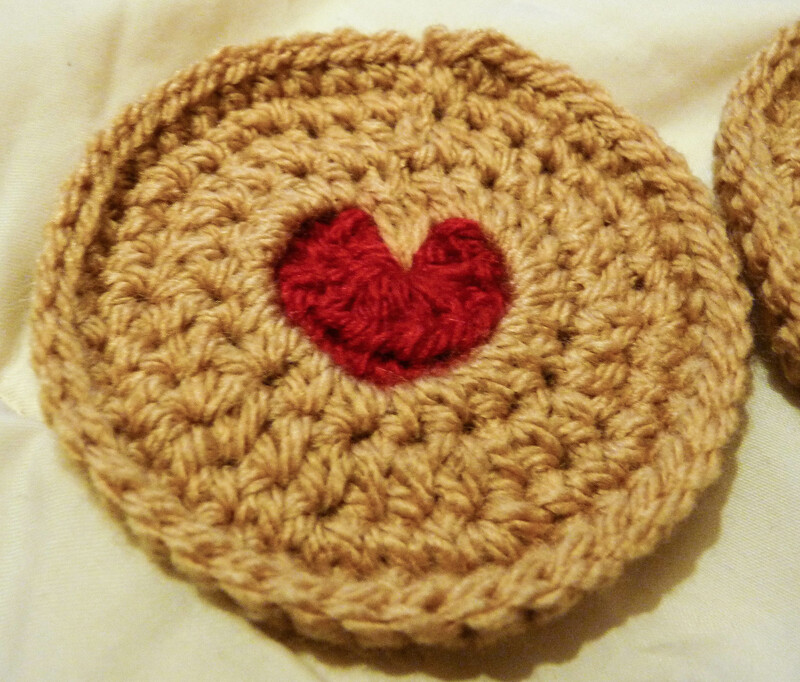 I’m much faster at crochet than I am with knitting though, and they don’t seem too big. It’s also an excellent opportunity to use up some of my stash yarn that wouldn’t get used otherwise. I’m thinking of maybe purple, lilac and white for the cute version, and green, dark green, and some other decay-ish clour for the zombie one if I get round to it. I’m thinking blue or something but I’m not sure. I’v been knitting a lot recently for the Ravellenics and just because I want to get this jumper finished, so I might need a small break after this. My hand is already screwed up from doing an exhibition piece for work experience, and I don’t really want to make it worse. If anyone has any tips to stop wrist pain then please feel free to tell me.